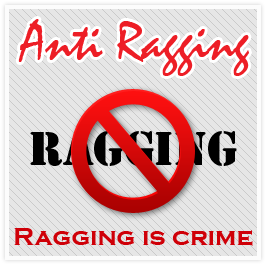 As per order of The Hon`ble Supreme Court of India,”Ragging is an Offence”. Any student found to be directly/indirectly involved in ragging not only loses his/her candidature from the institution but is also liable for punishment under clauses 7 & 9.1 of the regulations .The students and their parents are required to file an affidavit in this regard that they are fully aware of the penal and administrative action liable to be taken if found guilty in any type of ragging activity. The college has formed committees consisting of members from staff and public that consistently monitor the situation. On the walls and website of the college, posters containing messages against the ragging have been posted which will warn the senior student about the consequences of the ragging. 1. Human Rights Commission has taken act of ragging very seriously. 2. The college administration has adopted zero tolerance policy in this regard and sufficient measures have been taken by the college administration to prevent the act of ragging in the campus and outside. One anti-ragging committee consists of senior faculty members and students have been formed in the institute to ensure zero ragging. 6. Debarring from representing the institution in any regional, national or international meet, tournament, youth festival etc.